During a recent conversation, Q reminded me that diabetes doesn’t define her. 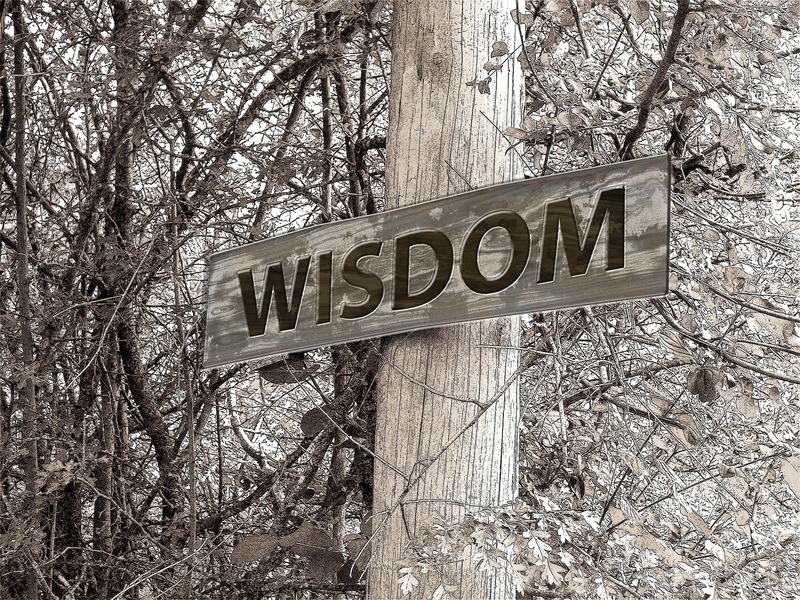 Read why kids with diabetes have wisdom beyond their years. In many ways diabetes shapes who our kids are. It gives them independence, great math skills, and maturity beyond their years. I recently had an idea for a pretty involved project that would require a lot of Q. It’s a really great idea. I was taken by surprise because she has always jumped at the chance to educate, advocate, and volunteer. She told me that diabetes isn’t her whole life and it’s not what she wants to be known for. I’m not sure if it’s because she’s a teenager now. I’m not sure if she has so many other things to explore and focus on. I’m not sure if it’s something else entirely. As she explained to me her reasoning I found it incredibly interesting that she would rather be known for something else and just happen to also have diabetes rather than being known first and foremost for being diabetic. When I started listing off famous people with diabetes, she reminded me that those people are not famous because of their diabetes. They are famous but also have diabetes. She has lived ten years with type 1 diabetes — the majority of her life and really all she’s ever known — and it has always been part of who she is. But she has the wisdom to say that it’s not the most important part of who she is or how she wants to be seen. Q generally goes along with all she has to do to manage her diabetes. Does she always want to stop what she’s doing when her CGM alarms? Does she always want to stand next to me for an extra 30 seconds while I enter the information into her pump to give her a bolus? Does she always want to run back downstairs or back upstairs to retrieve her pump or CGM? I once heard Dr. Polonsky speak at a social media event about “diabetes vacations.” Diabetes vacations are safe ways to give yourself a break from the constant attention that diabetes demands. For an adult PWD, it might be having your spouse do all your carb counting for a weekend. For a teen it might be having your parent figure out your boluses and draw up your injections. I had to laugh when I realized a little bit of diabetes rebellion that Q has been dishing up. Maybe it’s her way of taking a break. And I don’t make her. I give her that break, even though it’s a tiny break. I give her that control, even though it’s a minor thing to have control of in the grand scheme of things. She has an entire lifetime ahead of her to deal with diabetes. Why not let this one slide once in a while? While at a diabetes event Q and I approached the tables of several of the vendors. I’m already familiar with many of the products we don’t use, but many of them are new to her. We first walked up to the OmniPod table and as the rep started to tell us about it she informed him that she already uses it and that she currently had it on her back. But we wanted to grab a demo pod from the table. The next table was the local hospital and she was very disappointed that the guy in the blue bear suit was not giving out small stuffed blue bears like last year because she was on the playground and didn’t get one. She did grab some little first aid kits and a coloring book. The next table was Novolog and I just happen to have known our local rep my entire life. They showed her how the insulin pen works and Q told them that for school demos we use an orange. They gave us their little demo cube so that we wouldn’t have to use produce in the future. Score! The next table was the Animas table (I think). The woman started telling her what an insulin pump does and she cut her off saying that she already knows because she has one, but wanted to see what theirs was like. Thankfully the answer was no. The rep did whatever it is you do to insert it and there was a loud POP as the needle went in. Yikes. I’ve never actually seen the insertion of other pumps, but it kind of confirmed our choice. What wowed Q was that the insertion sets came in pretty colors and that the part that is attached is smaller than the pod. However she was not keen on the tubing or having to wear the pump itself all the time. Q, being the verteran diabetic and pump user, asked the million dollar deal breaker question. If you watch her Six Things and her Dream Diabetes Device videos, you can see that she has product innovation in mind–both in terms of form and function. 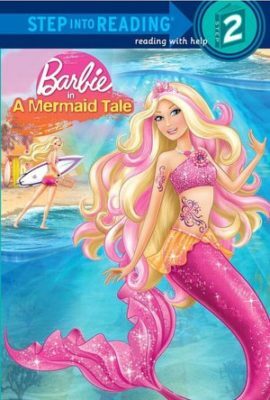 We read a story at bedtime in which a girl finds out that she’s half mermaid and ultimately is allowed to travel between the two worlds with the help of a magic necklace. Me: Would you rather be a mermaid or a real girl? Her: A mermaid. They don’t wear pumps. Me: But what if it was a mermaid with diabetes? Her: Mermaids can just take pills. She became quiet and had a thoughtful expression. I wondered if she was thinking about her diabetes. Her: My “Grandma Day” tomorrow. But even if I have fun with Grandma, I still love you. I recently told you that my daughter can in fact eat Girl Scout cookies. So the following over heard conversation was amusing to me. We were at a Girl Scout gathering and the girls sat down at the table to eat their lunch of pizza, carrots, and grapes. Q needed to test her blood sugar and did it in front of all the girls right at the table. The girls who are in Q’s class are somewhat used to seeing her test, but some of the girls always look in awe and ask if it hurts. As the parents were doling out the food, the girls started asking her questions about what she can and can’t eat. Girl 1: Can you eat candy? Q: Yes, as long as I have insulin for it. Girl 2: Can you eat ice cream? Girl 3: Can you eat chocolate? Girl 4: But can you eat gum? Girl 5: But you can’t eat sugar. Q: Yes I can. As long as I have insulin for it! Q: I could even eat 120 carbs as long as I have insulin! Q had had a few lows this particular day. Her CGM had alarmed twice already predicting a low. We had returned home after running errands on a very hot afternoon. I was in my office upstairs when I hear the tell-tale chime coming from her CGM. She walked to the doorway of my office and very dramatically dropped to her knees and then flat on the floor, her hand opening to release the CGM receiver which continued on the trajectory. 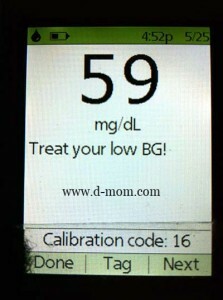 A blood sugar check revealed that she was 59.